We offer precisely engineered Induction Melting Machine that is widely used to melt ferrous and non-ferrous metals for further applications, precious metal melting and various other purposes. We have carved a niche as one of the major Induction Metal Melting Machine Manufacturers and Suppliers based in India. 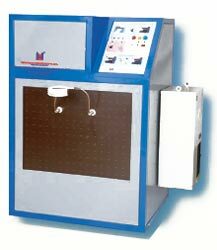 Our Induction Metal Melting Machine is designed to offer efficient melting of metals like gold, silver, steel, alloy and so on. High speed of our Induction Metal Melting Machine saves time as well as energy. Easy to operate, our Induction Melting Machine needs low maintenance cost. Power range 05 - 15 kW. 15 - 30 kW. 30 - 50 kW. 50 - 200 kW. Frequency range 05 - 200 kHz. 05 - 30 kHz. 05 - 30 kHz. 03 - 30 kHz. Input Power Range Single Phase 230 V / 50 Hz Three Phase 440 V / 50 Hz. Three Phase 440 V / 50 Hz. Three Phase 440 V / 50 Hz. In our endeavour to make better products, Microtech Induction Pvt. Ltd. reserves the rights to change any specifications at any moment and with prior notice, to the models ( including programming), their accessories and optionals.